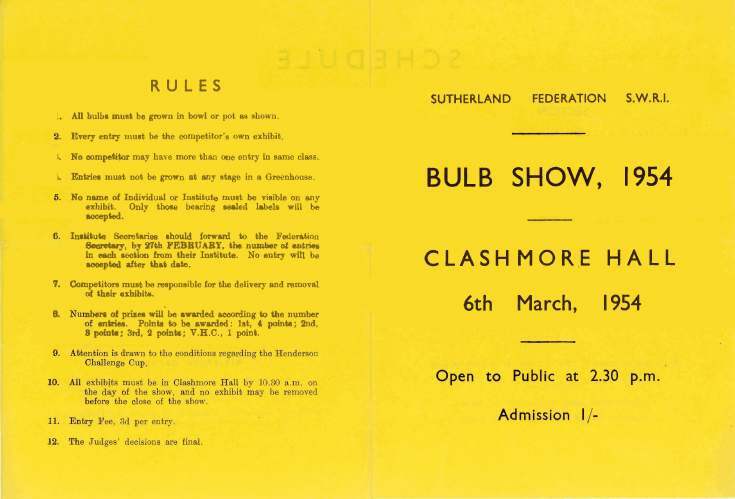 Copy of the Sutherland Federation SWRI schedule, printed on yellow paper, for the Bulb Show held at Clashmore Hall on 6th March 1954. The cover shows the admission price of one shilling. The schedule on the inside pages lists the growing bulb classes in Section 1, the Challenge Cup and the growing bulbs, cut flowers and minature garden classes in Section II, the Londonderry Cup. The rear of the schedule list the Rules for the event.